Birds of a Feather – Spray-paint Together. 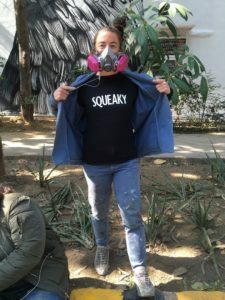 At Squeaky, we believe that everyone is capable of some form of artistic expression. Moreover, we believe everyone is entitled to it whether you are a producer or simply a fan. As a company, we strongly encourage our team to explore their creative vision in any and all ways. 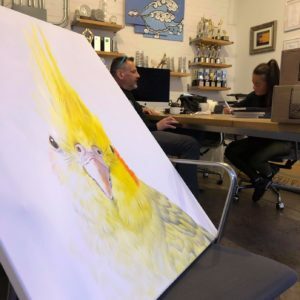 Recently we had the pleasure of collaborating with the insanely talented, Adele Renault to work on a personal portrait of our office mascot, Cuca #2. For those who are unfamiliar, Cuca #1 (RIP) is the Head of the Client Services department who entered our lives 10 years back when she landed on our fire escape of the Hudson River. Being the noisiest member of the Squeaky family, we decided to honor her in the best way we saw fit (as we did chippy via Nychos). We found the perfect artist to capture her majesty in Ms. Renault. 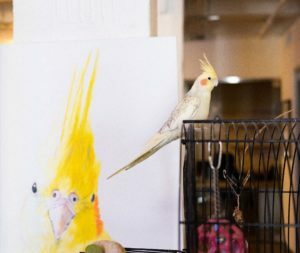 Adele specializes in painting realistic portraits of birds and people, on canvas and murals. From her own bio, Adele’s “Subject matter may live in the gutter or in an ivory tower.” Her work is a true appreciation in the natural and underlying beauty no matter what the object may be. 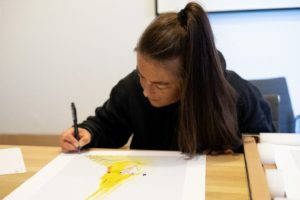 Adele was born on a farm in the Belgian Ardennes, but at the age of 14 began to spend much of her life traveling the world focusing on perfecting her craft. 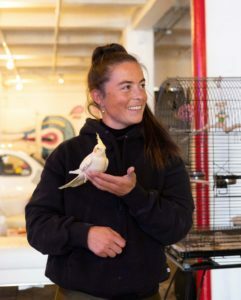 She is most prominent for her large murals of birds, typically pigeons, that can be found on distinct walls in various parts of the world (including Jersey City where we caught her in the act of painting). We reached out to her because we were struck by both her work and commitment to bringing out the essence of her subjects so powerfully. While signing the prints, Adele shared with our founder Anthony her fondness for fellow ardent pigeon fan Mike Tyson. “When I first heard his story of how he first got into fighting (through pigeons), I fell in love, it was like a fairytale to me”. “I will meet him – one day.” Adele promised. Much like the mindset of Adele, we believe that everything deserves more consideration than initial perception. Being a creativity-driven company, we are extremely invested in art and in supporting artists. Adele brought fresh energy into our office and her work has left a lasting impression on our whole team. 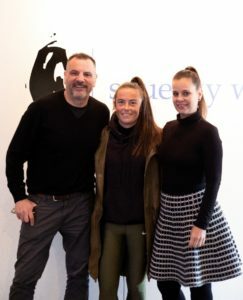 At Squeaky we aim to provide an environment that encourages an open and creative atmosphere because to be invested in art is to be invested in culture, and culture is the soul of it all. One of our very first clients was recently sold to General Mills for $8 Billion.